A playground is where children can take off and flourish. Playgrounds large enough in structure and design. Enabling children to enjoy their fullest, like run, jump and hide, making a mess, shout to their fullest and explore the natural world. A variety of factors determines the quality of the playground for children and infants. These factors mainly include play equipment structures. Quality of product from playground equipment manufacturers. Safety standards used by them. Physical activities should form an important role in building a playground. There are two fundamental factors why outdoor kids playgrounds are important for children in early childhood. Firstly they help children in achieving risk-taking, exploring, motor skills etc. Hence outdoor play provide an effective learning to children. Secondly outdoor play, in modern times, is superseded through the excessive use of digital media. Thereby keeping them away from physical play and outdoor playground equipment. Outside playgrounds play an essential function in the general improvement of kids. Selecting the right equipment enables kids to keep physically match and improves social skills by encouraging social interaction. One of the primary aspects that attract youngsters to a playground is the type of equipment placed there. If the equipment is excellent, kids can go in and play without having parents worrying about their safety. To enable you to decide on the correct playground equipment, you should pick the correct outdoor playground equipment suppliers. Under are several pointers to assist you with this. * Choose a supplier focusing on what you need: This usually has two advantages; the supplier can give your expert knowledge on what they sell and you will receive quality products. If you need to buy different types of equipment at the same time, select a supplier who will be able to offer you a broad range of equipment that you could select from. * Examine the ratings and reviews of the outdoor playground equipment suppliers: In addition to investigating the reputation of the supplier, get more information on the reputation of the equipment supplied. Ultimately, this can allow you to invest in quality equipment that won’t simply be worth the money spent but also offer a quality performance by ensuring safety. * Find out if the supplier offers used equipment: If you wish to preserve your financial allowance, it can save you money by investing in used outdoor playground equipment. Should the supplier offers this, make sure you only invest in equipment that is still in good shape. * Compare prices between different outdoor playground equipment suppliers: Price should not be the only factor for which you want to buy. Instead, choose quality. However, comparing prices between different suppliers will allow you to find quality equipment at affordable costs. If you come across under-priced equipment, investigate them carefully before you make a buy. * Choose a supplier with reliable business history: This really is more important if you want to purchase playground equipment the supplier manufacturers. A supplier may have a reliable history if it has performed well for a few years. Choosing such a supplier means you will be able to receive help when acquiring or troubleshooting without any stress. * Get customer references: Should you speak with enough previous clients of the outdoor playground equipment suppliers, you will have a better picture of what to anticipate from the suppliers. Most suppliers will readily give you three or four references. The more the references you have, the higher your chances of forming a realistic impression of how the suppliers will treat you during and after purchasing equipment from them. Always spend some time when selecting an outdoor playground equipment supplier as where you do your shopping could easily effect on quality. If you are searching for the best playground equipment, the guidelines above are an excellent place to begin. Make sure to test the quality of the playground equipment before you decide to buy. If the supplier enables you to test some of the equipment before you decide to buy, the better. Kids sometimes have a hard time building and maintaining positive levels of self-esteem, particularly when they get to their pre-teen and teenage years of life. There are numerous things that can hinder good self-esteem such as school, learning new skills, peer pressure, and all of the other difficulties that come with growing older. If you think that your kid’s self-esteem can use a boost, here are some tips you may use that might help. Too often parents are quick to discuss things a child does wrong, without celebrating and acknowledging the things they do right. Make a conscious effort to notice and encourage the things that your kid is excelling in, even if those things might not seem like a big deal. Needless to say, you should always be sure to be honest in your positive comments, as children have a talent for sensing insincere comments. Kids are influenced by things which gives them joy and challenges. Take them to kid’s playground where they can play with interesting playground equipment. They should be taken to the parks as it is the best form of entertainment for them and it also help them to boost their physical activity. You can also help to build up your child’s self-esteem by reassuring them in their successes and celebrating whenever they do well. As an instance, if your child plays sports, try to attend at the time of playing to support them. Taking pictures at the games, which you may then display in picture frames, is also a great way of showing your child that you see and support their achievements. Even if your child eventually decides that a particular sport is not their favourite thing, they will likely gain from the experience of giving it a go. Sports is essential for healthy living. Encourage them to participate in sports because its preserver of health. One of the finest ways to boost your kid’s self esteem is to help others feel good. Motivate your child to become involved with volunteer activities, help other children, or even assist their elderly relatives. Your child will not only have his or her self-esteem boosted, but they will also acquire some great experience in the process. To create sweet memories, you should take photos of your child participating in volunteer activities. Proudly showcasing your photographs in picture frames all through your house will help you to show your child your love and support of their activities. You can even boost your son or daughter’s self-esteem by demonstrating to them how to help out around the home. By doing so, your child will learn valuable skills, while developing a deeper sense of self-confidence in their own abilities and skills. Though learning and trying out new things is not often easy for kids, you and your child might actually be surprised to discover just how much they are able to do if they really work at it. Taking up a new sport, joining a club, or simply getting involved in a fun new hobby or activity can be a great way to build self-confidence and self-esteem. Your child might just discover a new hobby, or even learn a new skills that could give them a new identity. Your child may also learn a few things about using their imagination when they try new things. Playing maze, educational toys force them to use their brain which is useful. Whenever you are able to you should take the opportunity to get some snapshots of your kid having fun with their new hobbies. You may show your support and love to your child by placing these pictures in picture frames and then displaying them around the house. In fact, your child might even want to display a few of the pictures in their own bedroom. So do not worry about your kid any longer. Use these suggestions and your kid will feel better about themselves in no time. Check out website to buy interesting customised playground equipment and games for you children. An Outdoor Play Sets are a structure, which is placed outside to enable playing on and around for children. Typical attachments of an Outdoor playset comprise of Towers, bridges, ladders, climbers, slides, swings and monkey bars. A major component of an outdoor play set is a tower. It is a vertical structure, having one or more decks, placed at different levels. A deck is basically a horizontal play surface, which is either contained within or attached to a tower. Bridges act as connectors between different towers to enable children to walk through them. They are of two kinds, fixed bridges or curve bridge, swinging bridge. Rope ladders and fixed ladders are the most common essentials for playsets. Slides and climbers often accompany an Outdoor Play Sets. Playground slides may be covered or uncovered. Free-standing Swing Sets also form a primary requirement of an outdoor playset, since swings are mounted on them. Besides bridges, monkey bars also act as a connecting medium for towers. Numerous materials are opted for surfacing the ground around a playset. Surfaces range from normal earth to EPDM rubber flooring, rubber tiles, rubber mulch or artificial grass. A photogenic and well-equipped park is the perfect landmark that draws many peopleâ€™s attention. A beautiful theme park wants lots of visitors posting their pictures that tell the world, where they are – and that makes their friends wish they were there, too. Here are a few important aspects that need to consider before setting up a Theme Park. A great theme park needs to have a beautiful environment that everyone wants to visit. If it covers with lush green grasses, it will very attractive. People can feel the freshness of the place. The well-maintained garden inside the park is another nice addition. Families like to enjoy together. Height restrictions or age restriction separate them to enjoy properly. There should be areas to play for children as aged members like to see them enjoying. People shouldnâ€™t stand in a queue to enjoy rides. There should be an ample amount of playground equipment such as Slides, Swings, playground spinning etc. Children spend their weekends and summer vacation and have fun with friends in the park. So these things must be included. Toy Train ride at slow speed is an exciting fun-filled activity for all generation. It is one of the favorites among children. Visitors enjoy the ride and the surrounding beauty of the theme park very much. Great theme parks create an engaging environment that gives children a great time. Parks should provide ideal space for children so they can run around that keeps them physically active. A well-maintained playground is a wonderful place where children absolutely forget about themselves and enjoy every moment in the seventh heaven. Sunburns and other heat-related problem is a major concern during outdoor activity. Shades and sun rest are important to have in a park. Whether it’s Kidâ€™s playground, bathroom or gymnasium everything should be linked so that people can walk around and use every facility. People like to dress in sportswear while working out. So, having changing rooms and washrooms for elder members is very important. Kids should be trained to use the toilet properly. Thatâ€™s why suitable kids toilet is important to have and it should be clean and hygienic. Big parks have many facilities. There has to be a charging point for mobiles and laptops so that people don’t have to rush to their home for work and can continue their workout simultaneously. A great park should accommodate with First Aid services. Fort that a great team is required. Companies need to pay attention to their employees so that they roam around the park and monitor every activity. This is the way a park can become an ideal place for everyone. Exercise is important to stay healthy for everyone. We all donâ€™t have outdoor fitness areas but is rapidly becoming popular as a means of fitness. You can take membership of any gym, and there are other resources also to provide you equipment for outdoor exercise. Hi5 Solutions provides all the types of equipment and detailed information to give you the ultimate benefit of outdoor fitness. Getting a good outdoor fitness training location is a vital task and should be a major concern. Usually, people choose a spot that is very prominent, close to pedestrian or vehicle traffic. Companies who provide outdoor fitness services want maximum exposure as most outdoor businesses do not have a physical shop front. Before arranging the space we need to think about a few important things such as lights, training surfaces, toilets, drinking water, options in the rainy season, shade and protection from the climate changes. It is obvious; doing outdoor exercise has similar advantages and principles of gym-based exercise. We can tone our body, shape and strengthen muscles with weights, lose weight burn calories and progress in cardiovascular stamina with numerous running exercises and activities. So if you donâ€™t like the indoor exercise in the gym, then you should opt for outdoor fitness programs. Hi5 Solutions encourages all of our clients to participate in all sorts of physical activities to change their lifestyle. We motivate you to go for a run or swim, join a sporting group to boost your health for overcoming all sorts of health-related issues. We provide exclusive outdoor equipment that offers great comforts and secure ambiance to get you the ultimate benefits. You can find many websites online provides high-quality sports equipment, tools gears at various prices. 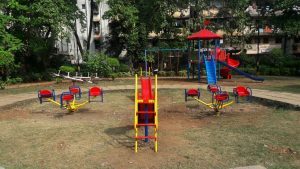 The Hi5 solution is one of the largest playground equipment distributor or manufacturer of India. They have been in this industry for several years. Besides, they are supplying commercial playground equipment and park accessories. Your children will get the best opportunity to enhance the physical as well as mental skills. All their equipment and tools are designed as best safety standards to provide a safe play zone for children. Hi5 solutions specialize in play zone development, sports flooring, outdoor fitness, Playground Equipment, and accessory services. For all those who prefer the outdoors fitness program, Hi5 Solution has many good options to stay fit by balancing what you will normally do in a gym with what you would like to do outdoors.